The growing Naxal problem is known to every Indian national, the origination of which however is still dimmed in the mist of time. 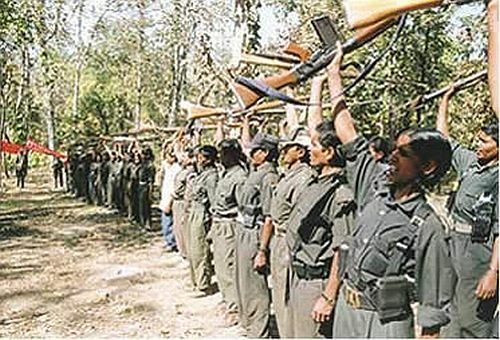 ‘Naxal, Naxalite and Naksalvadi’ are the terms used to refer to a communist militant or groups operating in parts of India under different names. Having control over the eastern states of mainland India (especially Chhattisgarh, Jharkhand, West Bengal and Odisha), they became widely known as such, at times referring to themselves as Maoists, while in southern states like Andhra Pradesh they are known by different titles. The Government of India have declared them a terrorist organisation under the Unlawful Activities (Prevention) Act of India (1967). Leaders of these ‘militant’ groups have been found to have hideouts in China. The term “Naxal” originated from the village of Naxalbari in West Bengal where the movement first began. The Naxals are far left radical communists, supporters of the Maoists’ political sentiment and ideology. The origin of the movement can be traced back to 1967 when the then Communist Party of India (Marxist) split led to the formation of the Communist Party of India (Marxist–Leninist). The epicentre of the movement was West Bengal. As years passed, it spread to lesser developed areas of rural southern and eastern India, especially states such as Chhattisgarh, Odisha and Andhra Pradesh, with the help of underground groups like the Communist Party of India (Maoist). In the fight for “justice”, their movement grew from displaced tribals to natives and relentlessly fought against exploitation from major Indian corporations and local officials whom they believed to be corrupt. The origination of the Naxal issue is surrounded by two basic realities, ‘socio –political’ and ‘socio-economic’ repression. The Zamindars exploited the poor and the landless. Land reforms were obsolete. Forest land was taken over by private entities. Additionally there was no development in the area and poor governance crippled the administrative system. At first, States sought to contain the issue using the State Police force. Ill-equipped and few in numbers, the state police were in a poor state. Their numbers, weapons and available infrastructure were no match to this fight; they were very ineffective. Looking for an alternative solution, Para-military Forces (PMF) were called in. Failing the government’s ‘containment plan’ the movement became more coordinated and crossed into other states. To tackle this situation, the then Central Government announced a new initiative, referred to as the ‘Integrated Action Plan’ (IAP) for wide, coordinated operations, especially for dealing with the Naxalite problem in all affected states (principally Karnataka, Chhattisgarh, Odisha, Andhra Pradesh, Maharashtra, Jharkhand, Bihar, Uttar Pradesh, and West Bengal). Additionally, the plan was also equipped with a grass root socio-economic development program for Naxalite affected areas, along with increased financial aid to state police for the containment and reduction of Naxalite influence in these areas. By 2009, Naxalite were in control of 180 districts in 10 states of India. After the first full year of implementation of the IAP Programme (roughly around August 2010), Karnataka was removed from the list of Naxal affected states. By July 2011, the number of Naxal affected areas was reduced to 83 districts across nine states. In December 2011, the Central Government reported that the deaths and injuries nationwide had decreased by almost 50 per cent from the levels of 2010. One should understand that the Para Military is the elite force tasked to handle insurgencies. Except in one or two cases, as the Naxal insurgency increased, the PMF were drawled. Besides equipping the state police forces, PMF were called in, why? Well, this is a question that eats me most of the time. The jealousy of involving other state police officers in the region along with the continuous infringement with sister states was one reason as to why state police forces failed to handle the issue. Since the problem stretched out to many states, no security agency in the center was assigned to lead. I would say the situation was more like a balloon. If you applied pressure on one side, it would swell the other side and Naxals would then mitigate to other states. There was no interagency coordination, followed by poor planning. Forces with different weapons, tactical trainings and manpower tend to work differently in anti terrorist or insurgent operations. The difference lies in its leaderships, command and control, organizational and operation awareness. CRPF (a Para Military Force) is deployed in platoons or companies, often attached to local police units with no specified area of operations. Inspectors are often in their 50’s with insufficient knowledge of terrain or local conditions. Stamina and Motivation is usually low also as the younger leadership cadre is missing. Most of the time State Police Forces are used for intelligence. There is absolutely no coordinated intelligence grid and Inter State Intelligence sharing is missing. Even when there is a valuable exchange of information, the reaction is very slow and the ‘valuable information’ does not reach the command chain in time. No doubt the Government of India has spent a lot of money in acquiring advanced weaponry and equipment. On the contrary, training is where we lack. Not long ago an AF Remotely Piloted Aircraft (RPAs) were deployed over Dantewada; the Aircraft was able to detect a large gathering of Naxals in the region. CRPF troops were trained in slithering from choppers as the roads were inaccessible due to heavy rain. The choppers were ready, but CRPF troops took more time to assemble. Targets do not remain in the open for long; they are hunted down in the right moment, in the right time, that’s how we get operational success. The Security Camps are to be organised and modernised. Improving training standards is a must, new weapons and equipments are to be practised. However, a communication grid needs to be established. Still to this day, police in different states continue to play the traditional role of ‘law and order’. In spite of growing insurgencies, terrorism and extremism compromise their ability to keep pace with the modern threats. One of the key factors that led to the rapid spread of Naxals in 223 districts of the country within a short span of time is no counter terrorism or countering policy of the state Police with respect to Naxal cadre. As mentioned earlier there is absolutely no coordination with the state police, making it easier for Naxals shifting from one region to another, unchallenged. In many states today, police stations operate in ‘makeshift’ conditions. Policemen have neither access to advanced weaponry nor have proper housing in which to live. Often during operations they are not led by officers, more low level Sub Inspectors or Inspectors which then results in a lack of judgement and operational errors. There are operational planning and concerns for the men on the ground, safety, security, rules of engagement often being avoided. The lack of coordination among State Police Forces is designed to a pattern rather than habit, depending more on Para Military Forces for assistance. One such example of ‘dependency’ is the deployment of 33 battalions of the Central Reserve Police Force (CRPF) personnel in Naxal operations. This decision was taken by the center when demands for more deployment came from the states. It not just one state that has requested more forces, many states have repeatedly come up thus far. This is precisely why the Union Government decided to increase the strengths of Paramilitary Forces. Central Government’s decision of police modernisation is one way of making state police forces equipped. All major points under the Police Administration schemes from the construction of secured Police stations to outposts, Police lines, mobility, modern weaponry, security, surveillance, communication, forensic science laboratory equipment, upgrading of training infrastructure, Police housing, computerization, etc, have been included. Although looking at the Police Administrative reforms of 1969-70 the schemes had many discrepancies, being open for changes only after the 1990’s. In Andhra Pradesh, 63 percent of the Police stations do not have four wheelers. In Jharkhand, 114 vehicles were purchased for two armed battalions of the state which had only 120 personnel. In West Bengal, against the targets of 324 residential buildings and 800 non-residential buildings, 96 residential and 52 non-residential buildings were constructed. In Andhra Pradesh, Police stations continued to depend on outdated weapons, as the procurement of modern weapons was inadequate. The majority of weapons were kept in district headquarters. Jharkhand purchased 1470 SLRs for two battalions having 135 combat personnel. In Bihar, Police telecommunication network system (costing Rs. 4.96 crore) remained non-functional due to the non-construction of a tower. There was a shortage of wireless sets. Even the batteries procured were not adequate for the available wireless sets. This affected the communication system. One of the most important steps in police modernisation is increasing the number of police personnel, both in terms of filling vacancies while at the same time conducting a large scale recruitment. It is not hidden that the number of police personnel guarding the area per population is very small, especially in the Naxalite affected areas. If I compare this to the United Nations Peacekeepers’ law, such ratios adversely affect the working of Police Forces. Moreover, the lack of adequate forces on the ground has resulted in a complete dependency on Special Police Officers (SPOs) or local militia such as the Salwa Judum in Chhattisgarh. Although increasing the number is vital, this alone will not resolve the issue. Recruiting more people and training them in all aspects of law and order will increase the state’s handling capacity. For example, Jharkhand had poor a Police-population ratio. This ratio dramatically increased with the appointment of 14,265 constables in 2004 and 2005, proving quite the deterrent for Naxals, which today control just one out of 24 districts. The success of Greyhounds in Andhra Pradesh supports the need for Special Commando Units to tackle Naxals in the regions. These forces will have to undergo intense training in hostile environments, followed by comprehensive marksmanship and superiority in guerrilla warfare. There is also no denial of the need for actual human intelligence (HUMINT). In many regions occupied by the Naxals, intelligence networks established by the State Police either fail or get destroyed by the Naxalite. The elimination of human intelligence poses a grave threat to forces operating in the region as, needless to say that, without intelligence the workforce of commando units operating in the area would work inefficiently. The killing of 35 Greyhounds personnel from Andhra Pradesh in Orissa in 2008 is another reminder of how crucial intelligence is for effective counter operations. Lack of intelligence by the Orissa Police led to a situation where the Greyhounds team were trapped by the Naxalite while travelling in a boat in Orissa’s Chitrakonda reservoir. The boat lost balance and commandos drowned in the river. Whether or not a modernised police force make an effective stand towards the Naxal is a discussion that requires political decision making. Politicians take control of the deployment of forces leaving the highly skilled and trained strategists no choice but to follow orders. Mismanagement is one such issue that need to be tackled effectively. For example, a large chunk of anti-Naxalite commandos passing out of Chhattisgarh’s Jungle Warfare School at Kanker are being deployed in VIP protection duties rather than in counter Naxalite missions. As a result, the entire process of creating these smart men fails. As a matter of fact little has been achieved by increasing recruitment. This entire procedure has not been documented in any great depth and thus will result in problems from the management of the Naxal to basic ‘law and order’. States have to understand the need for specialised training in countering extremists. This stretches the importance of Greyhound models in every Naxal affected State. Shall we deploy Green Berets? The Indian army’s involvement in any format of Naxal operation is restricted. The Indian Air force is tasked to carry out logistics, support and rescue missions. An Indian army veteran is in charge of the counter insurgency training school in Chhattisgarh. However many fear that an escalation of the situation may result in the Indian army’s involvement in the region. Even after the Naxalite shot a few rounds at an IAF helicopter trying to get to the policemen, the central government remains ‘policy less’. Apart from some statements by the Indian army, military experts decline the idea of involving them in the conflict; the army is trained in different areas, varying from sea to land hence fighting at home would be a challenge. I am still amazed by this attitude as people tend to forget a long time ago the battle hardened troops fighting impeccably against the insurgency in the north east. The army has helped develop an effective counter insurgency grid in Jammu and Kashmir, with the police personnel now playing a more ‘proactive role’. However, the anti army belief keep all hands on deck. Many still support their fact by questioning the military policy of killing ‘home grown’ insurgents. The ‘Naxalite’, in spite of their involvement in violence, are still considered ‘Indians’ who ‘want to fight’ for their right. Hence, military experts question military strategy of the Indian army on this turf. No matter what terminology you use to define it, extremism will always be dealt with by bullets. There is a need to examine why different police forces, equipped with different weapons, tactics and handling capabilities are asked to fight a common enemy that ‘never fought before’ on their turf. The variation in performance is due to different leadership, age, profile, manner of employment, professional ethics, logistics, chain of command and responses. It is very important to provide defensive gear to police forces but it is more important to train them in tactics such as – networking with the population, population control, intelligence collection and sharing, combat operations and coordinated development activities. Grouping public health, education, public works, irrigation and agriculture specialists with the CRPF to form cohesive multidisciplinary task forces will send a message of the government’s seriousness in addressing basic problems of the people along with the resolve to deal with violence. Being a resident of one of the affected states and having seen extensively how operation mechanisms work, I would say that the threat has become too large that it cannot be tackled on all fronts. The Government should either follow the ‘constructive governance’ approach by trying to gain control of the areas most affected by Naxals, like the Bastar Region or Malkangiri etc. If the government seeks instant success, then the approach should be from ‘outwards’ to inwards keeping the post constructivism in mind. The first approach is better and I would personally recommend it as the government would then not take the ‘headache’ of overspending and deploy all available resources at once. Focusing on roads, agricultural industries and smaller projects will bring back the ‘long lost hope’. Let the people choose who is harming them, let them make a stand and let the state machinery bind with the people. Once the basic needs are met, people will decide who brings people safety, security and progress and will withdraw their support from Naxals. This difference in the quality of life would inspire them to make the right choice and would inspire others to make the right choice too. In the beginning, rendering resources to rebuild destroyed structures will not make the people take the government’s aid; we have to understand that the people no longer trust the government, hence under this scheme, Confidence Building Mechanisms (CBM’s) will make them lean towards the system. If we want to fight against the Naxals, we need to act like the Naxals, as anything new imposed on the people will make them lean more towards the Naxals. In the short term, capturing and eliminating Naxal top leaders is also an area that needs to be looked into. We should understand one fact very clearly, ‘the key to success lays in the success of law enforcement agencies’ and law and order will only be restored once the Naxal forces are eliminated. Hence it is imperative that we conceptualise, plan and conduct operations with the clarity of aim, strategy and determination. Committing to commitments is just not enough. The strategy has to succeed, one major blow enough to prevent this. The Anti Naxal forces have to be mobilised, trained and properly led ; it is possible to do so. It will be better to provide separate combat leaders, instead separating the whole division from basic ‘law and order’ forces, posting fitter and younger Jawans in Naxal regions, providing adequate training and young senior leaders followed by battle hardened and experienced combat platoon commanders. For long tenures, selecting young soldiers is a must. Those who are comfortable working in teams should be preferred. As a matter of fact, it should be made mandatory for all police and paramilitary forces to serve with the infantry units as a three year basic tenure. They will thus be prepared mentally to face the challenges in internal security followed by discipline and leadership. I would recommend not deploying the army (and air force) under any circumstances, although taking their assistance in training, operational advice, coordination and development of intelligence, taking care of major appointments, handling logistics, etc, will definitely help combat Naxals….rather extensively. Naxalism poses a grave threat to internal security. That it will never succeed in its divine principles of ‘overthrowing the government’ is clearly seen. But if allowed to grow, it will damage the nation extensively. It will hamper the nation’s economy and internal cohesion, in the end damaging the overall progress of the nation, whereas deploying Armed Forces is not advisable as it would reflect a very ‘negative’ approach on the ability of the state and central police forces and PMF to control the situation. Hence, improving the handling capability of the PMFs and CPOs will make the situation relatively easy to contain while at the same time maintaining the hopes of our forces. Armed forces (excluding paramilitary forces) should never be used in an internal conflict. This is a clear cut solution. We cannot use armed forces as a face to cover up our inactions and inabilities. Instead, by modernising our homeland forces, this would set an example not only to those they answer to but to the people of India also. We cannot afford another 26/11. There is an absolute need to develop potential alternatives. Previous post Bilawal Bhutto Zardari offers excuse for what? The problem shall exist as long as the Indian government fails to train, equip, and motivate para military forces to actually confront the Naxals head on. It will fail if there is no central intelligence gathering agency to feed the data to the para military troops in a timely manner so they can execute their plans to eradicate Naxals in their area. In addition and in sequence the para military must win over the people in the area before trying to confront the Naxals head on. With the populations support the leaders of this group can hide, get food, shelter, and medical attention when it is needed. This in itself thwarts all efforts of the police or para military. To show improvement in the local economy, health, and other areas the population will warm to the outsiders providing the services they need. Suppress media coverage of the operations and they will be more successful in the area. Communication is the key to all the counter revolutionary activities. all agencies must be on the same page and coordinate their resources to allow the para military do its job. Treating people fairly, with justice, with jobs, can go a long way to taking the bite out of the insurgency and its support groups. From my limited experience with reading about and living through local terrorists, I think there are some common denominators here as to what are the causes of terrorism, basically, poverty and corruption. Countries, you must have marketable skills for your youth to do. The world is becoming very technological and planet demands are such that all skilled hands are needed on the deck to heal this earth. Here, are some of the major job industries that students should be thinking on earning a descent living: green companies (solar, alternate ways of heating and cooling, green chemists-think plastic oceans! entrepreneurs and managers, captains of industry to find work which is good for people and land, assessing natural resources-doing mineral, gems, oil, various ways of organic gardening, urban planning to include better water, solar, wind, hydro powers. A country which can make a reasonable car and can run cheaply off of solar, compressed air, even water will raise themselves up very quickly, sincerely good health and cosmetics,perfumes, resurrecting and rewriting history, archeology, space travel and colonizing other planets, harvesting the gold and helium 3 on the moon, clothing, new sciences that will include nanotechnology, people who can read the massive amounts of information from science and other fields of study and help write to make others aware of the findings. The arts can bring a good living to the artists by fulfilling their calling to do paintings, music, drama, etc. Just remember you are an advertisement for the future; be of beauty and good will in what you do. Education is the key, but if not professional jobs, perhaps construction, watch repair, small appliance repair, inventing, cooking, learning how to forage, replant the forests, replenish the oceans, set the example of sanitation and beautification of communities, disaster safety and on and on until your land is a reflection of love and care. Mindlessly, having children that a family can not feed should be out. Worse than too much population is too much population who are unhealthy, unskilled, untaught, and angry about all that and taking their cheated life out by harming others and destroying property. Why bring a child into a life of misery? If parents have 2 children, that keeps the population at an equal growth level. If you have 1 child, the population will lessen by a higher rate. We have too many people on the planet who are poor, unhealthy, no homes or employments, no water and no food! We should help the ones who are already here, and not have more until the country can take care of them and have a good, clean life. If a child is in danger of his life or limbs, women should try to find a country who are not "depopulating" the existing people or think about devoting your life to study to make the world better. The best ideas should govern the world, not force or fraud, terrorism, one wild group of rebels or another, or well dressed and educated people who design poverty. Make your own life into an inspiration to do good for others, the earth and yourself and teach that to your children, planet consciousness. Otherwise, we will be full of strife and struggles instead of celebrating life!